Diabetes.org defines Type 1 Diabetes in the following terms: The body does not produce insulin and it breaks down the carbohydrates eaten into blood glucose (also called blood sugar), which is used for energy. Insulin is a hormone that the body needs to get glucose from the bloodstream into the cells of the body. 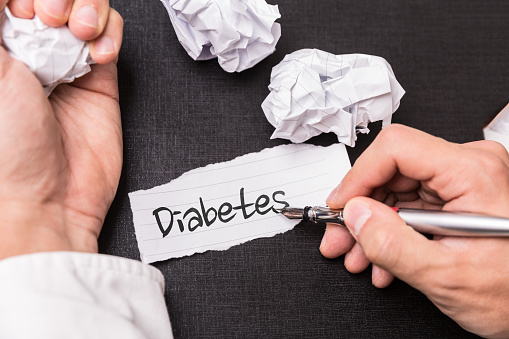 In short, Type 1 Diabetes is an autoimmune disease where the body’s immune system attacks its own healthy cells and destroys the insulin-producing cells in the pancreas*. And unfortunately, at this point, the medical community has not yet come up with a cure or a way to reverse this autoimmune disease. Fortunately, new technology, such as the ‘Continuous Glucose Monitor,” monitors blood sugar levels and integrates with a phone app to alert the patient that levels are changing. There are 1.25 million Americans who have Type 1 Diabetes, and unlike Type 2 Diabetes (29 million Americans)** where it can be reversed or controlled by diet and exercise, Type 1 is not a disease that is brought on by lack of self-care. Recently, I spoke with a young woman, named Kim, who at age 32, (she is now 33) was diagnosed with Type 1 Diabetes. There is a common misconception that Type 1 Diabetes is a childhood disease. It is true that age 14 is the peak age for diagnosis, but a person can be labeled as Type 1 later in life. There is a strong family history of Type 1 Diabetes in Kim’s family, starting with her dad who was diagnosed at 19 years of age and her mom at age 55. Additionally, because Type 1 is considered to be an autoimmune disease, Kim’s brother, although not diabetic, has Sjogren’s Syndrome, another type of autoimmune disease, often coupled with Rheumatoid Arthritis and Lupus. One of the biggest issues for Kim was that she felt guilty about her disease. Did she do something wrong? She always took good care of herself – exercising regularly, eating healthy, as well as having a positive outlook on life. So why her? It’s simple …heredity or a non-familial genetic component. Kim, a wife and mother of a 5-year-old, who works full time, says she must find ways to live her life as normally as possible. She says that this disease, at times, is emotionally and physically challenging and knows that she must adjust to this ‘new normal.’ Though, not yet insulin dependent (she currently takes her prescribed pill dose of Metformin), she knows that insulin will be her next line of treatment in the not too distant future. She continues to remind herself that when her blood sugars are out of whack even though she is very strict about her diet and lifestyle, it’s not her fault. Kim’s suggests that those who may feel alone, frustrated or have feelings of guilt may benefit from a support group; she found hers on Instagram. The best piece of advice she can offer is to not be too hard on yourself. Acceptance and knowing that you can be healthy and happy while living with Type 1 Diabetes, is possible.